We know that ‘when it is from the heart it touches the heart’. We know that it does not take much to 'bruise' a child's soul and sense of self. We know that one day that child will be an adult, making decisions that impact on our world. What difference would we see in the world if we treated our children like tender shoots and 'handle with CARE'? Care is the curriculum and care is the key that unlocks to that next wonder- full and magic-all play and discovery, the primal needs of each child. The foundation for care is love and kindness. Hence it is so critical we teach from the HEART. It’s love and kindness that gives children a ‘nest’, a place where they feel safe, with a sense of belonging. Higher order thinking and creative thought can only happen when children have such a ‘nest’. 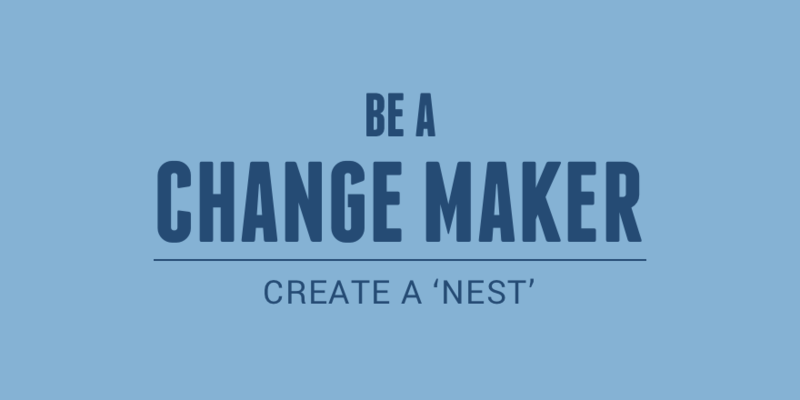 What makes up a ‘nest’? - Teachers teach from the heart. Heart centred teachers concentrate as much on who they are as what they do. They strive to hand on heart say they are seeking and striving with all their heart to be the best they can be with children. What they say and do and think supports their teaching from the heart. A heart centred teacher is prepared in the head, heart and hand so they can at all times give the child their full attention and the gift of presence. They create time for just being with children, observing, listening and being present for what is taking place before them. They hold the early years as sacred. - The environment is a child’s pace and space where beauty is the norm. It is beautiful inside and outside, in the seen and in the unseen. A beautiful and homely environment provides children with a multi-sensory banquet where they can choose from a smorgasbord of offerings. They can use all of their senses to explore and to see beyond what is just on the surface. The outdoor setting is both a familiar part of their environment and yet ever changing and the perfect place to be a child, to create, to imagine and to dream. The environment is prepared for children to be able to move freely and to engage in activities for unlimited time without being hurried to move on to the next activity. Children can play to their hearts content! Of all the fundamental gifts we offer to children time is perhaps one of the most important. Only a children’s pace will suffice. - Children can make deposits into the heart bank and build ‘Anniversaries of the Heart’. Children never forget the teachers who gave them memories that are heartfelt. The rich deposits of love get stamped in the child's heart forever! When a child experiences satisfaction and pleasure through LOVE and CARE then the imprint will indeed be one of the heart. Kindness is the norm. Kindness is a direct and critical 'deposit' into the child’s 'heart account'. It honours the spirit of the child. Children may forget what they did but they will never forget 'how' they were treated. Kindness is a critical deposit into their hear bank. In summary, a ‘nest’ is a place where children feel totally 'at home'. If we put into words exactly what we want the children to hear it would be, "you are so welcome here, this is your place, it belongs to you. We know you can find true happiness here and we know that you'll thrive. Come in and make yourself at home"! When the child has a ‘nest’ where they feel they have been nurtured with love and care, and they feel satisfaction and pleasure, they will feel confident to fly and leave the nest. We CAN provide a ‘nest’ if we so choose. If we actively and consciously decide to LIVE our core values; love, kindness, beauty and tender care - and consciously make them part of the programme in a way that the child not only HEARS these values, but also FEELS these values, we are well on our way of creating a ‘nest’, and well on our way of being a change maker. Newer PostThe power is in US - For, not against, is what we need more!